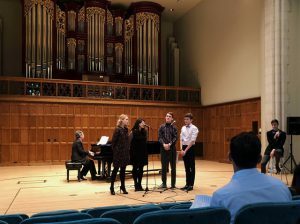 On Sunday, Feb. 3, the Music Department presented a cabaret as part of Modfest, Vassar’s annual arts festival. The show explored the festival’s theme, “In Motion.” Courtesy of Delila Ames. Modfest’s cabaret performance opened with a dynamic rendition of the titular song from the film “Hollywood Party” (1934) and took the audience from the early thirties to the mid-fifties in a vibrato-filled choreographed whirl. The cast’s commitment to the era was exemplified in their costumes, which featured an abundance of pearls and suspenders. Numbers like “Serenade in Blue” from “Orchestra Wives” (1942) and “Over the Rainbow” from “The Wizard of Oz” (1939) diversified the setlist. In accordance with the theme of Modfest, “In Motion,” each song originated from a motion picture from Hollywood’s Golden Age. This amusing play on words exhibited the subtle cleverness of the cabaret’s creators, who also sprinkled each performance with fun facts about Marilyn Monroe’s sexuality and Judy Garland’s acting career. Additionally, all of the performers presented a brief piece of context before their act. By using risqué patter, they created a sense of continuity that proved to be a punchy addendum to the show. The engagement with the audience further contributed to the zestful spirit in the room. The cabaret featured an Old Hollywood aesthetic. The theme was evident through its setlist, which consisted of movie songs from the first 50 years of “talkies,” as well as the performers’ vintage wardrobes. Courtesy of Delila Ames. This show has been in the works for months now, and the finished product reflects the countless hours of rehearsal. Vassar Staff Accompanist David Alpher and his wife, vocalist and lyricist Jennie Litt, organized the event. 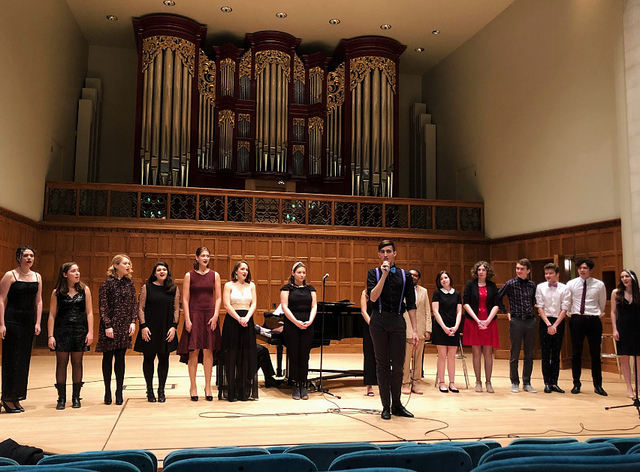 Alpher, an internationally recognized composer, accompanied each performer enthusiastically on the piano while Litt directed the event, which began as early as Dec. 2018. From private sessions months ago with Litt to dress rehearsal the day of, the performers were steadily committed. The Cabaret is a recurring occasion in Vassar’s artful history, as is Modfest. Jennie put together an extensive list of show tunes from Hollywood-era musicals from which the performers then picked. There were many homages to Judy Garland, from “The Wizard of Oz” to “A Star is Born.” The effort of the organization was evident, and according to audience member Gracie Nayman ’22, “[It was a] thrilling and satisfying experience [with voices that were] smooth like butter” and costumes that took the spectators back to a glittery era of gossip and drama.